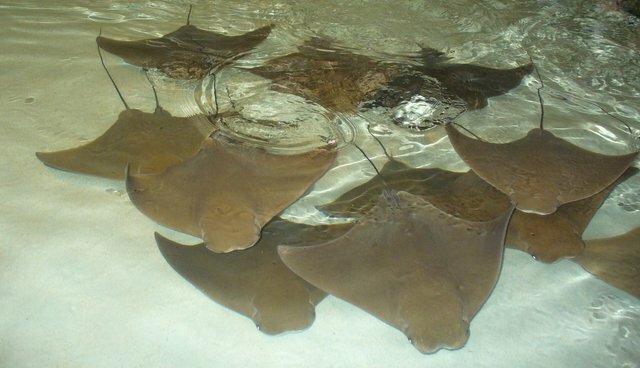 Earlier this month, 18 stingrays and 3 sharks on exhibit at Michigan's John Ball Zoo died as a result of a mechanical failure in their unnatural confines. The animals had been housed in a small outdoor lagoon, where guests were invited to reach in and touch them. To make the shallow pool livable, a life-support system of oxygen-supplying pumps was used to aerate the water. On July 8, however, after heavy rains caused those pumps to malfunction, all the animals were found to have suffocated to death. Zoo officials called it a "heart-wrenching incident" - but critics argue that it was an accident waiting to happen. "There are few exhibits deadlier than a touch tank," PETA wrote in a statement, "where sensitive aquatic animals are unable to escape a constant onslaught of groping hands that dirty and pollute the water with bacteria and where a single malfunction or mistake could suffocate and poison dozens of animals in one go." Rather than simply restock the lagoon, one of the zoo's most popular attractions, CEO Peter D'Arienzo says it will not reopen, at least in its current form. "It just doesn't feel right getting new stingrays when we don't have a proper backup pump," said D'Arienzo, as quoted by MLive. "No new stingray exhibit will be built until we know that can be done. We are responsible for these animals. It is our number one reason for being here. Anything less is not acceptable." While any zoo reforms made with animal safety in mind are certainly commendable, rethinking captivity itself would be the best move of all.